One of our Cocktail range Thick chunks of bitter Seville Orange Boiled slowly until the strong flavour comes through add chopped Ginger and Dark Rum and you have a Dark and Stormy Marmalade ‘Highly Commended’ at the World’s Original Marmalade Awards & Festival 2013. Absolutely delicious, best marmalade we’ve had with a hint of rum. It’s sold out straight away from our local store Fodder so having to order online! 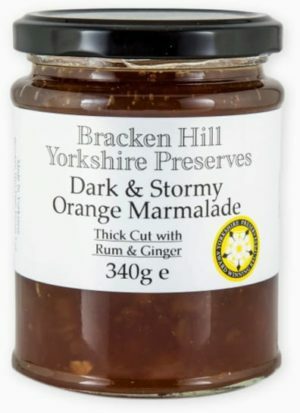 This has to be the best marmalade I’ve ever tasted lovely and strong but can you find it Pls send some to the two shops in Helmsley who sell your produce. I must have bought them all out. Sugar, Seville Oranges 28%, Stem Ginger 15%, Treacle 7%, Rum 6%, Lemon Juice (From Concentrate), Gelling Agent: Fruit Pectin, Citric Acid, (Prepared with 45g Fruit per 100g. Total sugar content 67g per 100g). May contain trace of NUTS.